The vast Amarr plantations on Syrikos V have used slaves as workforce for centuries. Scores of Ealurians, Minmatars, Ni-Kunnis and criminals or political dissenters of Amarrian origin have worked, bred and died by the millions through the ages. The droves of slaves needed to work the fields coupled with the high mortality rate means that elaborate methods of keeping the slaves in check, such as Vitoc, are not cost efficient enough to warrant their usage. Instead, the Amarrians employ slaver, sometimes referred to as slave-dog. 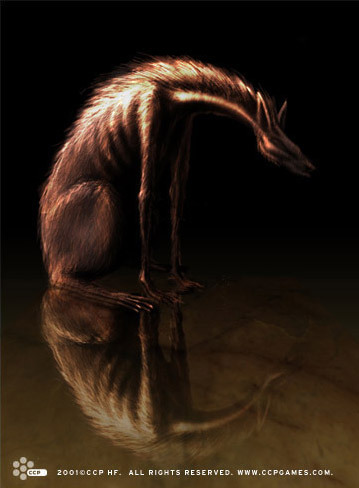 Slaver is a native animal of Syrikos V and has been bred by the Amarrians from the time they first settled the planet more than a millennium ago. It’s a vertebrate with four elongated feet and a slender, fur-clad body. A fully grown slaver can stand more than a meter tall from its shoulder-blades to the soles of its front legs. But the most noticeable feature of the slaver are its massive jaws and teeth, constantly slobbering in anticipation for something to chew on - hence the old name of the slaver before its role as slave keeper: Drooler. The slaver can run very fast and is able to jump vast distances, making this carnivorous beast a deadly foe against unarmed humans. Slavers are extremely vicious and blood-thirsty, but they can be tamed as long as the training starts while they’re still small cubs. The slavers are allowed to roam free outside the barbed parameters of the acres of the plantations. The agile slavers are quick to see or smell slaves that have ventured outside the fences and few can escape the slavers quick, merciless attacks. A preferred tactic of the slaver is to attack from above; for this it often lurks in high places, even trees, or by simply jumping many meters into the air and landing on their unsuspecting prey. The favorable experience of employing the slaver as a guard animal has led to it being exported from Syrikos V to most other Amarrian agricultural planets and even some industrial and mining ones as well. In recent years, the slaver has become fashionable among Amarrians as pet for those willing to risk its often murderous nature; slavers can become extremely loyal and devoted to their owners if handled with care.